Good to know: Step 1: see art. Step 2: write something! “Silent Vista” by Steve Rein was among the 24 entries in the exhibit which brought together written word and visual art and college and community. Emma Marlay-Wright, a seventh grader in the Albany City School District, has a passion for reading and writing. When she heard about a contest at the local branch of the public library inviting participants to view art and write their own stories, she jumped. Emma selected a drawing by Saint Rose alumna Darcie Abbatiello ‘00 titled “Beverly, 1951, Cleveland,” depicting a big-headed girl in a pink turtleneck and jeans. The drawing inspired Emma to write a short story about smart-mouthed Amelia Smart, whose head swelled as the result of a science experiment. Earlier this month, Emma was named one of nine winners of “Written Response Requested,” an arts-inspired contest the Pine Hills library branch presented in collaboration with the Saint Rose master of fine arts in creative writing program. Emma, 12, was the winner in the young adult category. “I think it’s really cool that a college is getting younger kids involved,” she said after reading her winning work at a ceremony March 4. 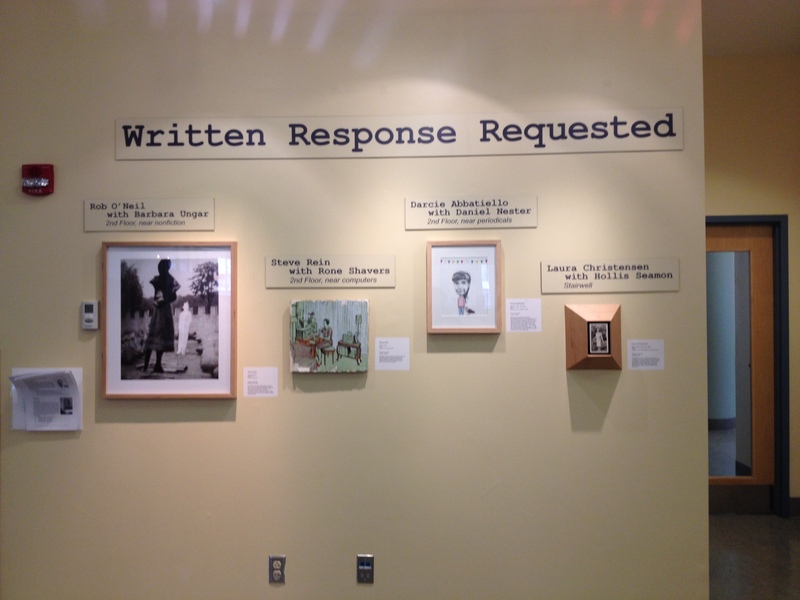 “Written Response Requested,” the library’s winter exhibit, features the work of four visual artists along with four authors who teach in the College’s MFA program. All library patrons were invited to use the written prompts of the Saint Rose writers to write their own responses to the art. Along with merging visual and written expression, the exhibit has merged College and community. Located just two blocks apart, Saint Rose and the library, after all, share a theme. “We have similar values and we each want to be immersed in the community, not just exist in it,” said Lauren Cardinal, a Pine Hills librarian. Daniel Nester, an associate professor of English, headed the project and contributed writing, along with colleagues on the writing faculty, Hollis Seamon, Rone Shavers and Barbara Ungar, who is the MFA program coordinator. 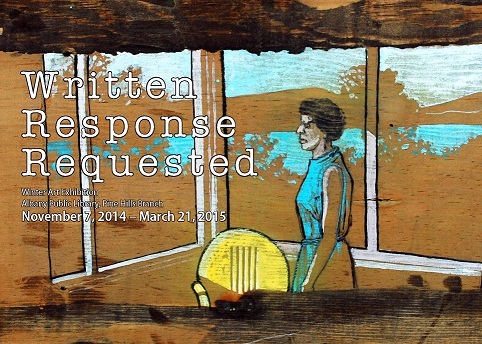 Participating artists include Rob O’Neil, a Saint Rose assistant professor of photography. Though the winners have already read their submissions, they can be seen, along with the original 24 pieces of art and prompts in the Winter Art Exhibition continuing until March 21.